Cosby and Murphy share the same attorney, Marty singer. Why did he even go on the show then, just to stand there? Bill is just too big to immitate. Well, you know, Cosby probably got Janet too. Lol. I wish he got me. Poor little perverted imposter. BLACK Bill didn’t want you but no doubt you have been “gotten” by gays of all races. Your love of all things Strom just isn’t going to get you anywhere…envy never does! Go back to your call center pod. I’m sure Murphy does not want to point fingers. He has plenty to hide. Small minded little imposter…it so likes to follow Strom and try to be like him! He didn’t seemed too thrilled to be there. 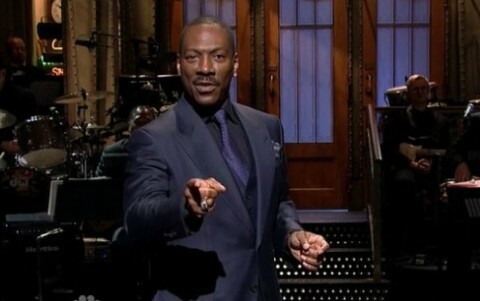 I don’t think Eddie Murphy can laugh at himself or not take things too seriously. Which seems kind of odd for a comic, but that’s how he comes across.